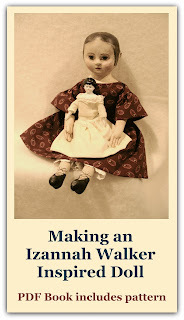 Izannah Walker Chronicles: Walker Dolls: A Family Affair? Walker Dolls: A Family Affair? Recently I was able to read two articles from UFDC's Doll News that shed some light on Izannah Walker. Both articles are by Monica Bessette. 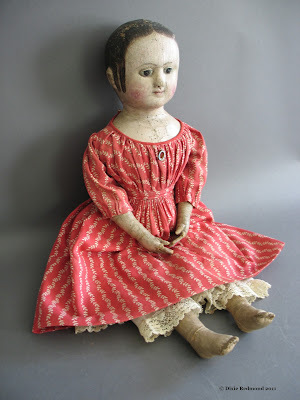 The first article, entitled The Search for Izannah Walker, proposes that a picture that Ms. Bessette owns is believed to be Martha Chase as a girl, holding her Izannah Walker doll. This picture is on lots of collected picture albums on the web. To see the picture, click here. In the picture the little girl (Martha Chase?) wears a plaid dress and the Walker doll is dressed similarly - lots of volume in the skirts! The girl's right hand rests on an ornate chair back while her left hand hugs her Walker doll close to her heart - just the place for an Izannah Walker doll to be! This article is in the Spring 1994 Doll News magazine. You can sometimes find them for sale on the web. In any case, if you're at a country auction and box lot of Doll News magazines come up, snag them! I think this is the glory of Walker dolls, they are each and everyone so different, yet each has their very own beauty and personality.